Netspot WiFi Analyzer for Android is a new free networking application to survey wireless networks that are picked up by the Android device. The app is made by the same company that released Netspot for Windows, a sophisticated desktop program to survey wireless networks. The Android application is not as feature-rich as its Windows counterpart; it lacks the ability to create a wireless reception map and lacks some of the advanced information that the Windows program displays. The Android application displays all wireless networks that the device picks up when you run it. Each network is displayed with its name, signal strength and some other information such as the used channel. Networks may be sorted by name and not signal strength with a tap on the settings button. NetSpot uses color coding to indicate the strength of networks; dark green is great while dark red not so much. A tap on any network switches to the comparison tab (you may also swipe to the left) which highlights performance over time. Multiple networks are selected by default and you may want to hide networks that you don't want to monitor to improve readability of the graph. Another swipe to the left displays an overview of the channels (2.4 GHz and 5 GHz are displayed on separate tabs) that all discovered wireless networks use; this visualization shows if multiple wireless networks use the same channel. If wireless reception is weak, it may be worth a try to move to a different channel that is not used by other wireless networks or weaker networks to improve performance of operations. NetSpot features a filter button at the top that you may activate to hide networks from the listing. Filters are provided to hide networks with weaker signals, certain security protocols, or bands; useful to reduce the noise especially if the Android device picked up lots of networks. The networking application scans and monitors networks when it is open by default. A tap on the scan button starts and stops the monitoring. 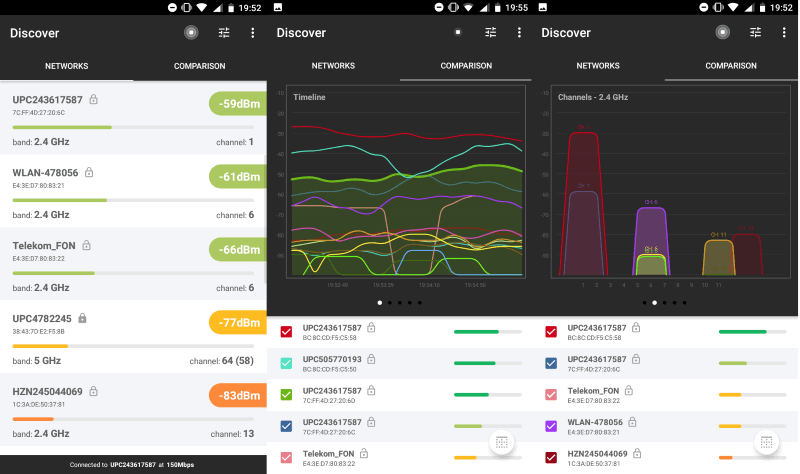 NetSpot is a useful Android application to find wireless networks with the best performance and troubleshoot some connectivity issues. The application is bare bones when you compare it to the Windows version or other Android applications such as Fritz!App Wlan that offer more functionality and are free as well. Does it do anything better than good ol’ https://play.google.com/store/apps/details?id=com.farproc.wifi.analyzer ? Well the new version requires location to be turned on.. I dunno to be honest, perhaps its better in terms of being more modern and up to date? I’m not sure what that even means. Being new does not automatically mean better. I will second a recommendation for WiFiAnalyzer. I agree. I’ve been using that for years and have been very happy with it.